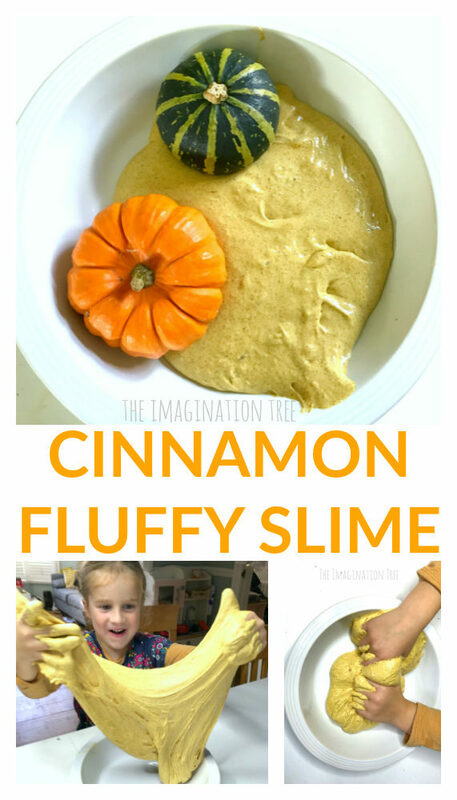 Make this wonderful cinnamon fluffy slime recipe for some Autumnal sensory play fun! 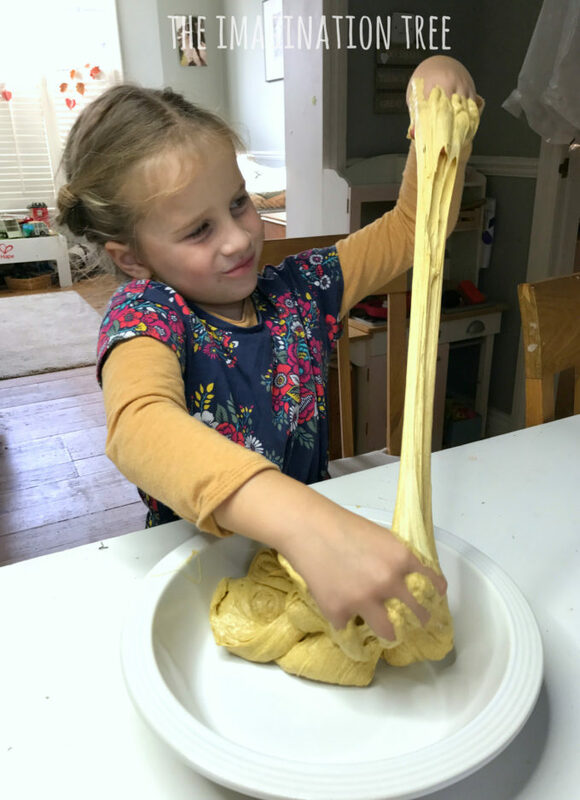 Perfect for messy, sensory input as well as fine motor skills and imaginative play, this is a slime recipe that you’ll want to try! 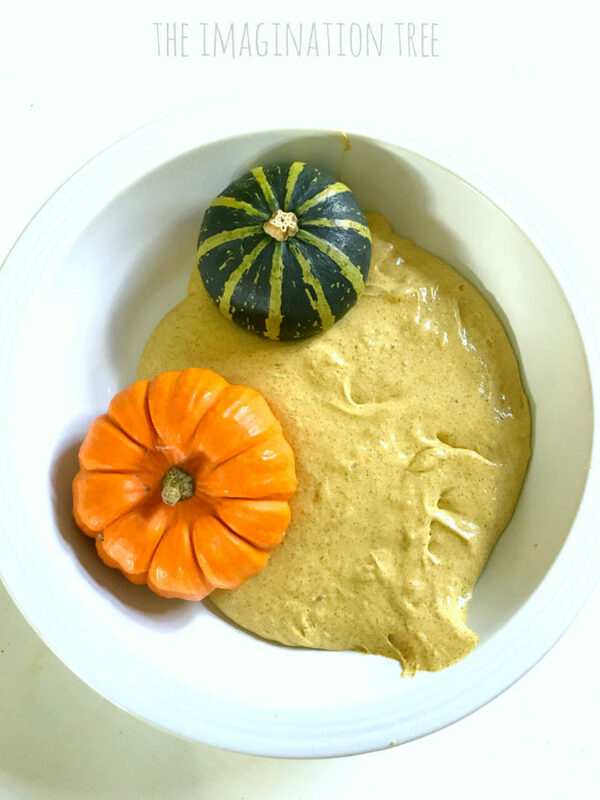 Autumn and Winter are so evocative of those warm cooking smells from the kitchen, the cosy and comforting scents of spices and baking. 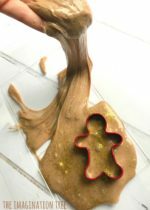 We have made lots of scented play recipes over the years (which are all worth a try too) such as Gingerbread Salt Dough, Cinnamon Play Dough, Gingerbread Play Dough, Autumn Spices Watercolour Paint to name just a few. 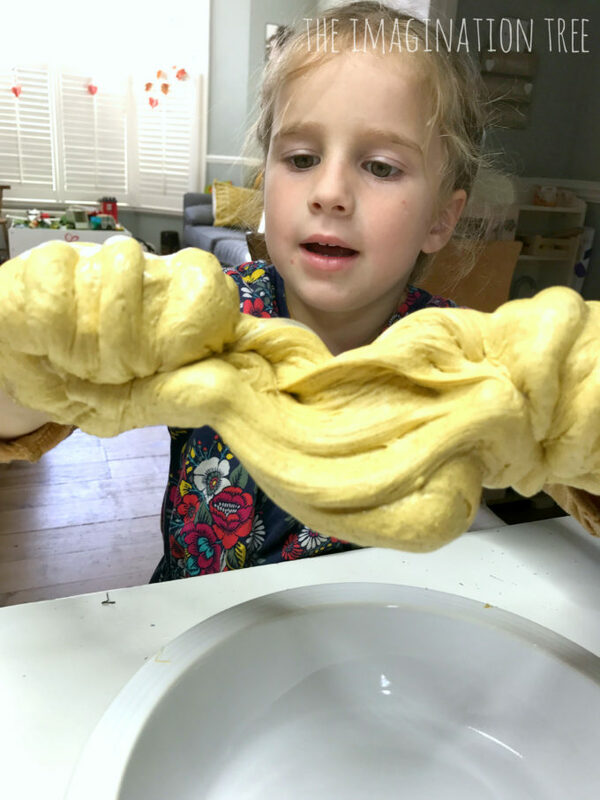 Now that we mastered the super fun SLIME RECIPE using UK INGREDIENTS we have been testing out new ways to adapt and play with that too, starting with this awesomely scented Cinnamon Fluffy Slime Recipe. It smells amazing and is so soft, stretchy and fluffy to play with! Mix the glue and food colouring in a large, clean bowl. Next add the shaving cream and fold it through carefully so as to retain the air. Sprinkle the cinnamon liberally and add more at the end if needed. Finally, add the contact lens solution in increments, carefully, until it is the exact consistency you wish for. 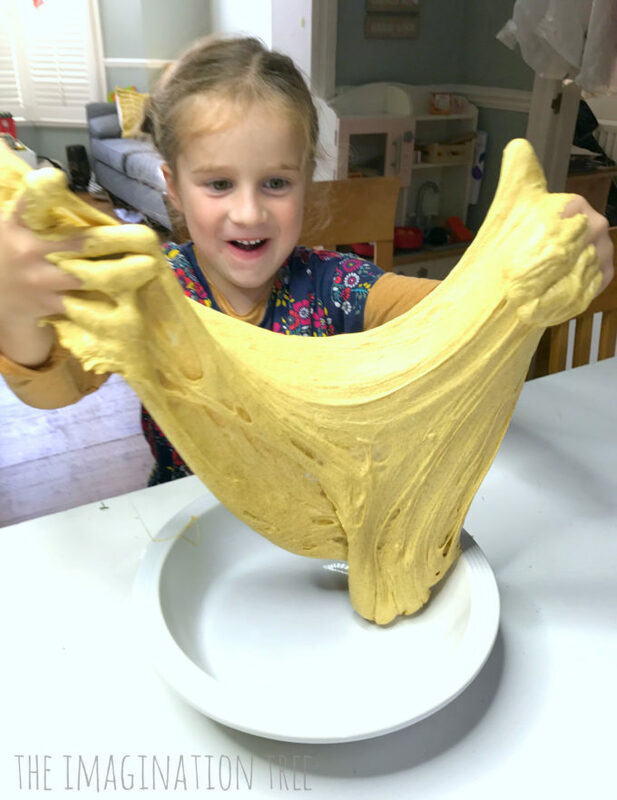 Mix it in the bowl and then get your hands in and start kneading it until it loses its stickiness and it becomes wonderfully soft, stretchy and pliable! Because of the added shaving cream ingredient it is sometimes necessary to add more contact lens solution to get the consistency exactly right. It’s not an exact science so play around with it. Note that the more contact lens solution you add the more brittle it might become, so take it slowly and try kneading it thoroughly first! We found this to be so thick and fluffy and it truly smelt amazing! The kids even asked what cookies I had made when they first smelt it in the house! Because of the extra fluffiness the volume was huge and stretched soooooooooo far when pulled! Miss 5 could make it stretch well over her height in length. 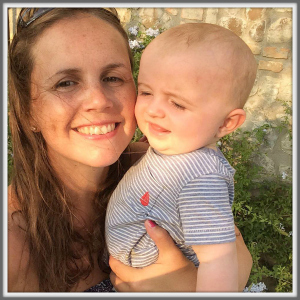 Recently my two year old got a huge lot of slime all over his lovely jumper and I honestly thought it was ruined as I couldn’t pick or wash it off for love nor money! But thankfully I tried one last ditched attempt to rescue it by soaking in a large bowl of warm water with washing up liquid (dish soap/ detergent) in it. 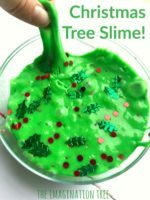 And within a couple of hours the slime had completely melted away and disappeared! I then washed the clothes as normal and it vanished. So don’t worry if this happens to you too, it’s remarkably easy to fix. Phew! 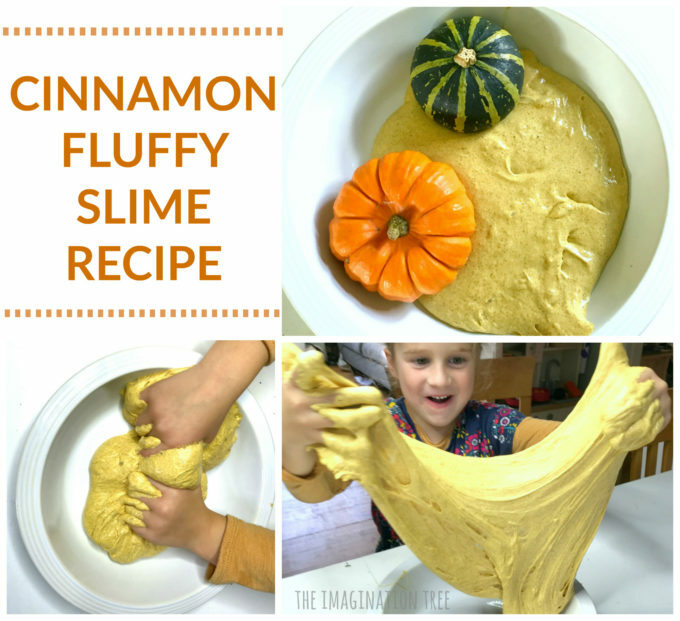 If you love this Cinnamon Fluffy Slime Recipe would you be kind and share it with others? Thank you! 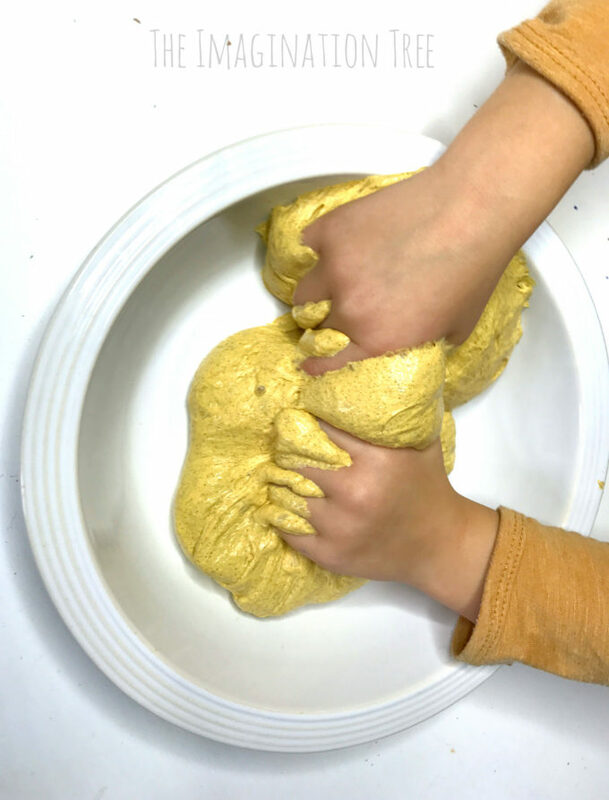 Find our huge archive FULL of SENSORY PLAY IDEAS and RECIPES if you need some more inspiration! Maybe try unscented next time? Hope it works! 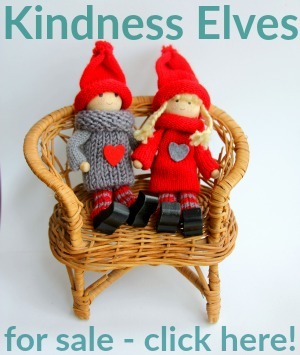 This is lovely stuff, but a word of warning. The better quality pva glue gives better results. I first tried with some cheap glue which I think was a bit thin and it didn’t work so well. You can certainly prep one day before but no longer or some of the materials start to separate again. Have fun!